I love Disney for so many reasons. It is my family’s number one destination spot. Over the years we have been lucky enough to be able to spend time at Walt Disney World and create memories that will carry on for a lifetime. Even though there are a handful of things I don’t like about Disney, there are more things that I love about Disney. 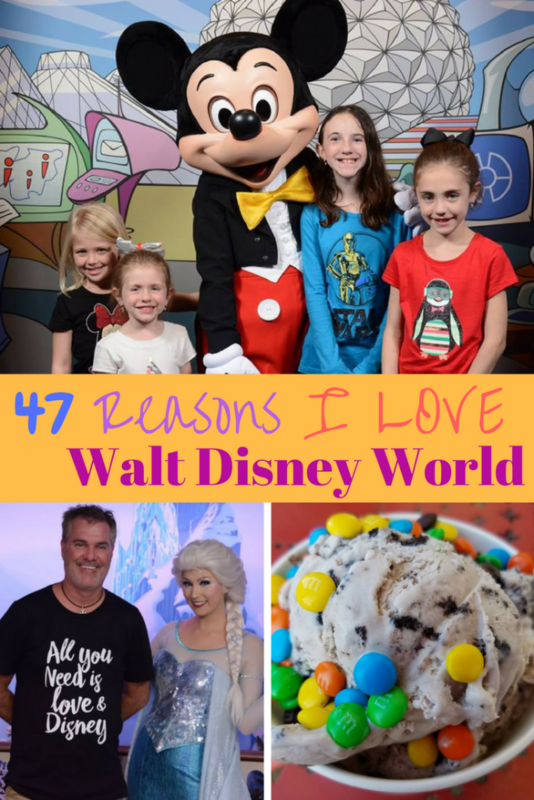 For those that love Disney as much or more than I do and for those that are considering going to Walt Disney World, I want to share 47 Reasons I Love Walt Disney World. Some of the reasons why I love Walt Disney World may seem simple to some, but sometimes the simplest things are the most magical. When you walk into the gates of Disney, it is as if you are magically transported into another world. A world where happiness and laughter are the only options. Everyone that goes to Walt Disney World, goes because they love and believe in the Disney magic. 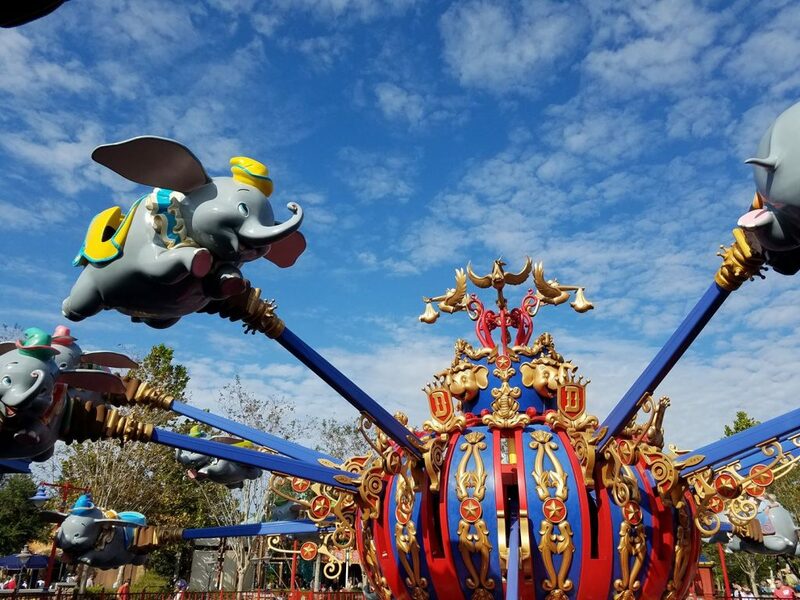 Walt Disney World keeps adding more amazing rides and park updates. One million (not really that many) languages are spoken at Disney. People come from all over the world to experience the magic of Walt Disney World. Outside worries and stress do not exist while at Disney. You get to eat with your favorite Disney characters. There are mouse ears, sorcerer hats, Donald Duck and Goofy hats at every corner. Families get together and wear super cute and creative matching Disney t-shirts. There is so much Disney history all over the parks. Disney Cast Members love their job and if they don’t, they are really good at hiding it. Disney makes transportation from park to park easy. They offer the ‘Memory Maker‘ at an affordable cost. With this, you will leave Disney with a ton of amazing pictures. I get to watch my girls transformed into a princess. Go here —-> to see how. Walt Disney World Cast Members want to make sure you are happy. During a visit to one Disney restaurant, my child wanted french fries but they were not on the menu. After 10 minutes passed, our amazing waiter served her a plate full of french fries! There are fireworks every night and not just regular fireworks but magical and amazing fireworks. Anna and Elsa stay in character no matter what. You can visit 11 countries in one day! When our family talks about our experiences at Walt Disney World, it always brings us together and creates a lot of smiles and laughter. The live shows are amazing. You can see a parade every day. Disney has an amazing amount of eating establishments to choose from. The architectural designs are fabulous. I could look at them all day. It’s where I got to hug my favorite Star Wars character, Chewbacca. There is always something our family hasn’t experienced each time that we go. The smiles on my kid’s faces make my heart blossom. I feel safe at Disney. Of course, anything could happen, but with all of the safety technology that Disney has, I truly feel safe. The Magic Band is the best thing created since sliced bread. It’s a key, a wallet, a ticket, it captures ride photos and more. Christmas at Walt Disney World is nothing like you’ve ever seen before. You can wear Disney apparel from head to toe and no one will blink an eye. There are a variety of Disney resorts that are on property to choose from. The smells and the sounds. We get to meet our favorite characters. You can go without your kids and actually have fun! Disney’s Hollywood Studios is like stepping into Hollywood but better. You can taste Coca-Cola from all over the world absolutely free. You can escape to Japan. Drink Around the World at Epcot. Princesses know how to handle crying babies and annoying husbands. If you have been to Walt Disney World, then I am sure that there are a million more things that you can add to my list of what I love about Walt Disney World. If you have not been to Walt Disney World, then I hope that you read through this list and are able to experience what I have shared with you.